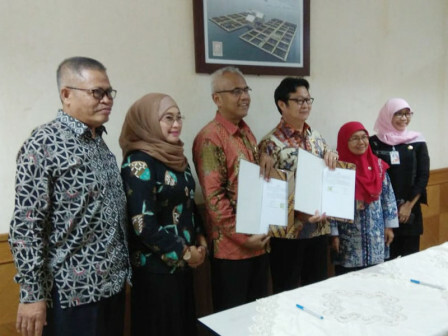 Jakarta Maritime Agriculture and Food Security (KPKP) Department collaborates with Bogor Agricultural University (IPB) to do analysis on food security. Agreement is signed by Jakarta KPKP Department Head, Darjamuni and IPB Business School Dean, Noer Azam Achsani.
" Hopefully our cooperation can accelerate the process of food security analysis "
According to Darjamuni, this collaborative analysis is expected to get a complete picture about food security development in Jakarta in order to realize food security to individual level. "It is to follow up MoU that was formerly signed by Jakarta Governor and IPB Rector on January 21, 2019, City Hall," he stated, Friday (5/21). Through this cooperation, his side wants to do food security analysis study relates to food balance including food supply and demand; supply chain and food distribution network; food alert system; food consumption patterns; and food subsidies analysis. "Hopefully our cooperation can accelerate the process of food security analysis and its result can be used for policy making in Jakarta," he conveyed .